Environmental stewardship is one of the founding principles of NEB. In 1976 NEB Inc. established the first shipping box recycling programme in the US and it remains in practice today on a global scale. In the UK we receive back 18%* of our polystyrene shipping boxes from our customers. Of these, 96% are reused and 4% are recycled to make new materials for the building industry. This is great but we would like to do better. You may have seen our happy boxes bringing your NEB products to you. We are very pleased to report that with the help of our customers we have increased the return rate by 20%**. After a quick spruce-up the boxes are ready to be re-used which means less polystyrene being manufactured and more donations to the Woodland Trust. This is great news and with your help, we can do even better. Read on to find out how you can contribute to this effort by returning your NEB boxes for re-use. Please help us to increase the number of boxes we reuse and recycle, and reduce the amount of polystyrene entering landfill. Reuse - use the FREEPOST return label on your shipping box to return it to us so that we can reuse it. Recycle - we recycle any returned boxes that cannot be reused. Reduce - choose NEB for all your molecular biology enzymes and reduce the number of shipping boxes you receive. Make your NEB box a happy box and return it home to extend its life! You will find a green and white Royal Mail FREEPOST label in the Document Enclosed envelope on your box. Simply peel off the backing, attach to your box and return with your regular Royal Mail collection. Please remove any ice packs to prevent water leakage. 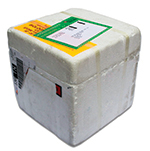 Our cold shipment ice packs are made from recyclable plastic and water or water-based gel. We encourage customers to re-use the ice packs but they are also 100% recyclable. The gel degrades in sunlight and is perfect for garden irrigation. For every box that we receive back from you we will donate 15p to the Woodland Trust. NEB (UK) Ltd is a Corporate Member of the Woodland Trust. the Woodland Trust is a UK charity dedicated to improving our environment by planting native trees and conserving ancient woodland. * Based on data from 2011-2016. ** First 11 weeks of 2019 compared to the same period last year.